Enid's Felt Bird shop features Oklahoma-themed gifts and jewelry. Ensure no one duplicates your thoughtful birthday or holiday gift by shopping local this season. Skip the shopping mall swarms and mainstream merchandise by stocking up on goods at these Oklahoma stores, gift shops and boutiques offering unique, handmade Made in Oklahoma (MIO) products. Choose from one-of-a-kind OKC Thunder tank tops and Oklahoma-themed jewelry to locally made jams and fragrant, natural soaps. 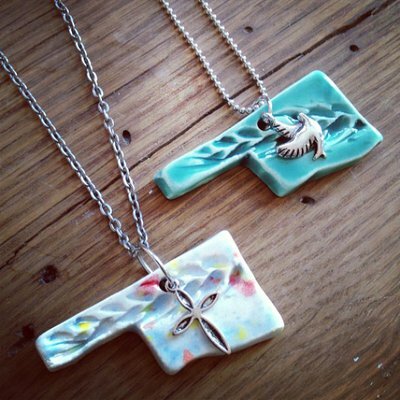 Shop with pride, knowing all items found at Okie Twister Co. in Sulphur have been handcrafted by Oklahoma artisans. Step into this Western-themed retail store to purchase everything from ornately designed metallic wrist watches and handset stone jewelry to Oklahoma-made craft soaps available in a range of yummy scents. Support your favorite college football team with an OSU or OU gift basket, or deck the family out in Oklahoma-inspired T-shirts or tank tops. Okie Twister also features a range of Oklahoma-made food products including Texoma Peanut Inn nuts, Trader Dave’s gourmet pickles and jars of Mema’s salsa. Find the finest MIO snacks, samplers and sweets for all the foodies in your life at this specialty food store. At Gourmet Gallery in Edmond, pick up personalized Oklahoma-shaped cookies or decadent Bedre chocolates hailing from Pauls Valley. Bring Little Italy to your loved ones with a jar of specialty goat cheese or anchovy stuffed olives from the famous Lovera’s Market in Krebs, or spice up any dish with locally made condiments like chipotle lime mustard or Red Hot Lover pepper jam, packaged together by local favorite The Prairie Gypsies. Head to Our Favorite Place in Eufaula for an astounding wealth of Oklahoma-made goodies and products. Browse through their impressive selection of Oklahoma paintings, sculpture and jewelry (all made by local artisans) before finding a book to take home from the shop’s wide variety of Oklahoman-authored novels, histories and cookbooks. Come by for your chance at sampling everything from local barbecue sauces to Red Dirt Pretzel Company’s spicy pretzels. Other great food items available at Our Favorite Place include jams and jellies, raw honey, local cheeses, soup mixes, Oklahoma pecan candy, Porter peach products and so much more. Fuel your shopping with a cup of freshly brewed Oklahoma coffee at the on-site coffee bar and don’t forget to pick up an Oklahoma-shaped gift basket filled with specialty items from the Sooner State. Peruse the shelves at Loud Mountain Trading Co when in need of the perfect standout MIO present. Come inside to grab a few handcrafted Native American works of art like beaded jewelry, feather dreamcatchers and handpainted tomahawks. You can also stock up on other handmade goods like ornate quilts made by local artisans or small, wooden trinkets and toys for the kids. This Cement gift shop also helps you express your personal style through home decor pieces like ceramic buffalos created in Chickasha or wooden chests made by a local U.S. Navy Veteran. You can also add a barbwire cowboy boot to your wall or a buffalo plaid deer pillow to your stash of couch cushions after browsing through goods on hand at this Made In Oklahoma store. Before you leave this gift shop, be sure to support local artists by selecting a canvas print to decorate your mantelpiece. Select one of thirty Oklahoma companies to support when you walk into 1907, a Made in Oklahoma retail space in Broken Arrow. As you step into the 1907 Apothecary, take in the wide assortment of authentic Oklahoma-made bath and skin care products. At 1907, these bath products are created fresh and in-store with a combination of natural butters like coconut oil and rosehip oil, botanicals, salts and fragrant essential oils. Next, walk into the 1907 Mercantile for a wardrobe update and pick up an Okie-themed t-shirt. Then, lock down your interior design inspiration in the home décor section of this Broken Arrow shop with Oklahoma coasters and Sooner State wall art. Feast your eyes on Oklahoma-inspired clothing and gifts at Shop Good in Oklahoma City. Rifle through the racks of Shop Good’s personal clothing line, Wandering Wear, and select a hand printed, earth-friendly t-shirt, cardigan or hoodie. Inside this shop, carefully consider which handstitched Simpleton Leather Goods design to gift the man in your life, from satchels, journals and key clips to bi-fold and vertical close wallets and custom-made belts. Shoppers can also single out a locally made dreamcatcher or Carl Zoch canvas print to spruce up their living space. Shop Good even keeps adorable baby and children’s apparel by Love Wall Handmade in stock. Check out Buck Atom's Cosmic Curios on 66 in Tulsa to explore a variety of Oklahoma artwork, gifts and gourmet foods found along Route 66. Local retailers offer exclusive lines of Made in Oklahoma products at Buck Atom's Cosmic Curios, from Baby D's Bee Sting hot sauce and The Little Bubble candles to Topeca Coffee roasted beans. Pop in and explore the one-of-a-kind curios on display alongside Route 66 snapshots and tees. Buck Atom's Cosmic Curios on 66 also stocks a variety of Tulsa pride products, from clothing and magnets to earrings and pins. Be sure to stop by while driving on the Mother Road, and take a photo with the official mascot of the store before browsing the artwork created by local creatives. Venture north to Tulsa’s Ida Red Boutique for an afternoon spent swimming in MIO nostalgia. Here, reminisce over days of teenage angst channeled through head banging at rock shows as you sort through a variety of Cain’s Ballroom merchandise. In Ida Red’s candy section, step back in time to innocent days spent sampling sweets and sodas. Tulsa natives or transplants can even share a sense of Tulsa pride with Tulsa-themed t-shirts, buttons, keychains, stickers and shot glasses. Ida Red Boutique also stocks just-for-fun gifts like Oklahoma magnetic poetry words, perfect for refrigerator haikus and sonnets. Step back in time to innocent days spent sampling sweets and sodas. Check out Enid’s Felt Bird gift shop and accessories store for a whole host of Made in Oklahoma products. After shopping here, you can display your team pride with Thunder t-shirts, earrings and tank tops. Crafters can even stock up on Scribner’s Beads & Fascinations beads and supplies for their next sparkling jewelry project. While making your selection at Felt Bird, purchase a few of the shop’s screen-printed specialties, such as Enid wheat T-shirts that are hand printed in the shop. Felt Bird also offers Homestead Candles from Spencer, perfect for filling your entryway with scents of sprig, sundry, mahogany and ambrosia. While selecting gifts for the ladies in your life, procure a pair of Go Ape By Sue bison and state-map earrings, or handpick a handmade plaid or geotribal infinity scarf or headband created by local Etsy artist Shanna Banana. Sift through Main Street Mercantile’s stash of local snacks and spreads, which line the shelves in this Pauls Valley shop. Chefs can spice up a dish with El Padre’s organic crushed hot pepper or slices of roasted green chile cheddar made at The Cheese Factory in Kingfisher. Pickle enthusiasts can also treat their tastebuds to a rollercoaster ride from sweet to spicy with a jar of Reno’s Pickles. Main Street Mercantile also sells gourmet berry syrups and fruit spreads from Wildhorse Canyon Farms in Luther, as well as Sweet Prairie Home fudge, available in salted caramel, mocha, eggnog, pumpkin spice and cookies ‘n crème flavors. Main Street Mercantile also displays Pauls Valley pride with cups, t-shirts, baseball tees, keychains and koozies branded with a special Pauls Valley logo. Browse through a full selection of fresh, homemade fudge next time you head south to Baker’s Mercantile in Tishomingo. In this shop, you can snack on a batch of the local specialty, Baker Pecans’ homegrown and seasoned cinnamon roasted pecans. You can also satisfy your sweet tooth with a hot cinnamon roll baked fresh in Tishomingo. Baker’s Mercantile also aids you in amassing a collection of artfully designed Oklahoma graphic long sleeve shirts, homemade quilts and beanies to gift when cold weather strikes. This Tishomingo shop also offers organic spreads and jars of veggies grown and cooked on local Amish farms. All counties converge at Native Roots Market. With its central location in Oklahoma City, Native Roots Market has easy access to local food products from all nooks and crannies of the Sooner state. Spend quality time browsing up and down the aisles at Native Root, taking in local cheese options like Christian Cheese’s ghost pepper, sundried tomato basil and red wine cheeses from Kingfisher. You can also pick up a jar of Seikel’s gold mustard from Tahlequah. As you line up your purchases at the Native Roots Market checkout counter, don’t forget to pick up an Oklahoma favorite, Lovera’s basil and tomato pesto, created in Krebs.